Simple and almost savage, a Barbarians Armor was often cobbled together from various pieces of leather, hide, and fur. Instead of being ineffective, though, this style armor was rather protective, as well as being a point of pride to its owner. A barbarian would pride themselves on their armor, not because it was protective or because it fended off blows, but because piecemeal suits of armor often contained trophies of personal accomplishment, creating a wild and distinctive look that made every barbarian unique. This suit of armor is made from 9-10 oz. leather and replicates that wild and savage look, doing the barbarian style proud. The armor consists of a cuirass that consists of several leather plates, layered over one another and tied together to ensure good movement and comfort when worn, while retaining that simple style of construction. Riveted on the front of the armor are leather plates adorned with circular decorations, which provide a bit of visual appeal to the armor, while also enhancing its strength as a defense. The Barbarians Armor also includes a pair of pauldrons, which, unlike most armor, are not identical. 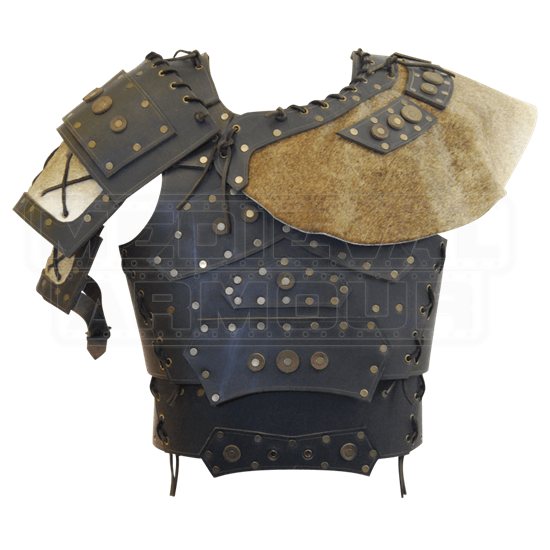 One pauldron is a classic piece of medieval armor, featuring leather plates that are angled and fastened together to protect the arm. This pauldron has two lower plates that are decorated with cowhide, while the upper plate features the same round decorations as the cuirass. The other pauldron is a decorative shoulder ornament that features a short cowhide shoulder cape, set with small leather plates and matching round decorations. Both pauldrons are attached to the armor via lacing that ties into the armors shoulders and chests, while the actual shoulder armor features a leather strap to secure the pauldron to the arm, ensuring that the plates move with the arm. The armor comes in two different colors, either black or brown. It is also available in four sizes and each size is quite adjustable. When ordering your armor, order the size that closest matches your measurements, and then adjust it to comfort when worn. Anyone who said that barbarians were simple were obviously mistaken, as this Barbarians Armor proves that even a barbarian, a savage, or a berserker can feature awesome style and ample protection, all thanks to this impressive leather armor.